Fontsmith. Neue Website. Neue Lizenzen. Neuer Service. Die britische Typefoundry Fontsmith veröffentlicht zum Release ihrer neuen Webseite auch gleich ein neues Geschäftsmodell, ein Service names Brandfont®. Ziel von Brandfont® ist es, Auftragsarbeiten für Marken oder große Firmen einfacher zu gestalten – sowohl für den Designer, als auch für den Auftraggeber. Das Arbeiten mit Schriften für Markenauftritte gestaltet sich oft sehr schwierig, da die Nutzungsrechte für Schriften von vielen, komplizierten Parametern abhängen. So wird es meist sehr teuer für eine Firma, einen Font für alle Medien und international einsetzen zu können. An diesem Punkt setzt der Service Brandfont® an: einmalig zahlen und uneingeschränktes Nutzungsrecht für den gekauften Font genießen. So werden Schriftenlösungen für Marken sehr viel einfacher und man kann sich als Designer ganz und gar auf die Gestaltug konzentrieren. Fontsmith launches a new fonts for brands service, Brandfont®. As part of a review of it’s licensing model, leading type design studio Fontsmith, has launched a new service, Brandfont®, and now offers webfonts and other formats for digital use direct from its new website. The Studio licence is intended for design agencies. The SME (small medium enterprise) licence gives small businesses the luxury of a relatively exclusive typeface, which can be used by all employees, on the website and by suppliers. The Digital licence was a little more complicated to define as digital use changes all the time. Fontsmith is now offering webfonts and mobile app fonts, direct from fontsmith.com, and have optimised all fonts for web browsers. Hearing these questions and seeing the constant change in the channels, Smith realised that to really help his customers, a totally new approach was needed. Having been successfully trialed with a number of client brands, that new approach is Brandfont®. Whether the brand is large or small; just starting out or being re-positioned; is operating in one or 20 countries; Brandfont® provides answers to all the key questions and gives the practical support required to make every brand a success. It is a one-stop service, providing everything, from logistic ease, knowing the right fonts to use, the controlled distribution of type with other brand assets, competitive pricing and, of course, distinction. To launch the new licence model Fontsmith has also invested in a new website that offers test driving of fonts directly online, extensive support and a helpdesk, new information and backgrounds to designs and designers, a re-designed blog and lots and lots of knowledge sharing. Not to mention a fully adaptive responsive design, from super desktop to retina tablets to smart phones. 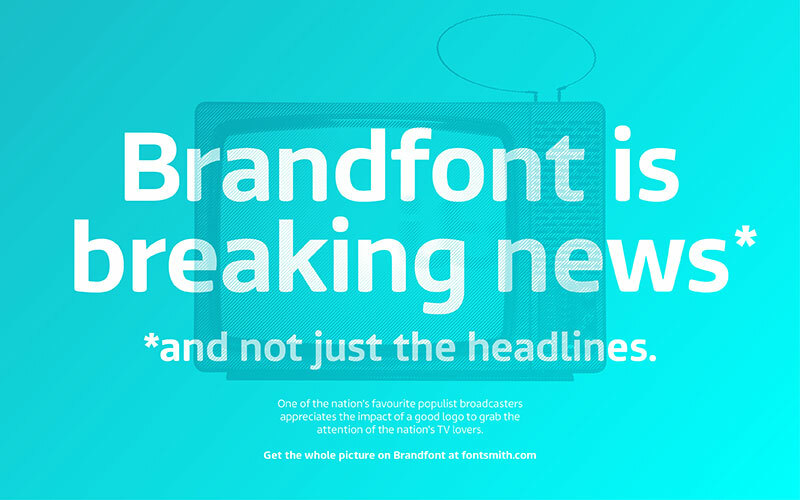 The launch of Brandfont® is aimed at reminding designers just how important great fonts are to successful brands.